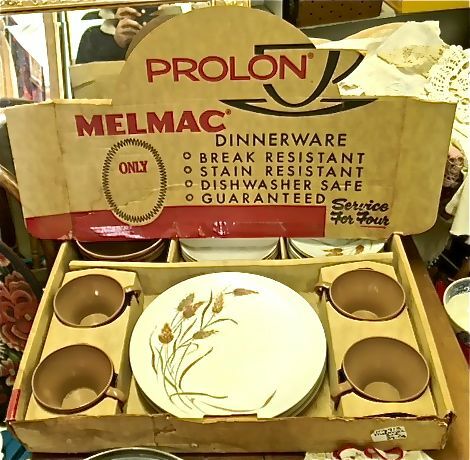 I found this set of Melmac dishes at an antique store in Southport, NC, a week ago. This is the set of dishes we grew up with. We had a table setting for six. The plates may have resisted breaking and staining, but they did, in fact break and stain. In fact, Wikipedia notes: "During the late 1950s and 1960s melamine tableware became highly fashionable. . . . The tendency of melamine cups and plates to stain and scratch led sales to decline in the late 1960s, however, and eventually the material became largely restricted to the camping and nursery market." Melmac was also the name of the planet where Alf came from, a planet whose motto was "Are you going to finish that sandwich?" Melmac is also the name of a university korfball team in the Netherlands. No one we knew had a dishwasher. Paula and I did the dishes. We fought over who would wash.